very clean hotel. would definitely stay here again! The property was being renovated, so not as convenient or attractive as it will be. Although it was noticeably older than the last Comfort Inn we stayed in, this one had some advantages such as full length mirrors on the bathroom door. 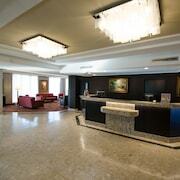 Where to find St-Antoine-sur-Richelieu hotels near an airport? Where can I find hotels in St-Antoine-sur-Richelieu that are near tourist attractions? Spending several days in Montreal - Monteregie and would like to stay close to central St-Antoine-sur-Richelieu? 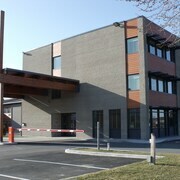 Central St-Antoine-sur-Richelieu offers 2 Expedia-listed accommodations within a 0.1-kilometre (0.06-mile) distance. Wanting a hotel within strolling distance of downtown St-Antoine-sur-Richelieu? 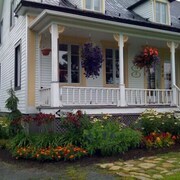 Gite De par Chez Nous and LA GALERIE B&B will suit your needs. 30 kilometres (20 miles) away from the main part of St-Antoine-sur-Richelieu, is the Hotel Mortagne. 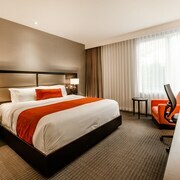 Alternatively, the Holiday Inn Express Hotel Saint - Hyacinthe can be found 25 kilometres (15 miles) away. 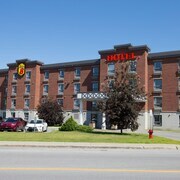 Alternatively, book a room at the Hôtel Rive Gauche or the Hôtel Le Dauphin Saint-Hyacinthe. Like to travel a little further afield? Montreal - Monteregie has many things to see. Montreal - Monteregie boasts forests and rivers. Commonly visited Montreal - Monteregie tourist draws include old towns and churches. Locals and visitors alike in this section of Canada often enjoy skiing. Montreal is 45 kilometres (27 miles) to the southwest of St-Antoine-sur-Richelieu and is where you'll find Notre Dame Basilica and Saint Joseph's Oratory. Should you wish to visit Montreal, check Expedia's booking pages for the latest deals at the Auberge de La Fontaine and Ritz-Carlton, Montréal. Alternatively, you could consider staying at Saint Laurent Boulevard, 45 kilometres (27 miles) to the southwest of St-Antoine-sur-Richelieu, where you can choose from the Hotel Le St-James Montréal and W Montreal. The L'ile Notre -Dame Beach and Olympic Basin are popular places to check out when visiting Saint Laurent Boulevard. If you enjoy sports and love watching local games you might choose to make a trip to Olympic Stadium, which is 40 kilometres (24 miles) to the southwest of St-Antoine-sur-Richelieu. 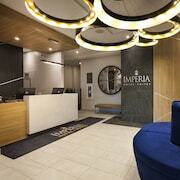 Sports fans wishing to find a bed near to the action can choose from the Loft Hotel or the Auberge Le Pomerol. Pierre Elliott Trudeau International Airport is a convenient airport, and is 55 kilometres (36 miles) from St-Antoine-sur-Richelieu. Nearby accommodation options are Montreal Airport Marriott In-Terminal Hotel and Hampton Inn & Suites by Hilton Montreal-Dorval. 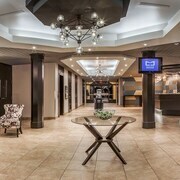 What are the most popular St-Antoine-sur-Richelieu hotels? Are there hotels in other cities near St-Antoine-sur-Richelieu? 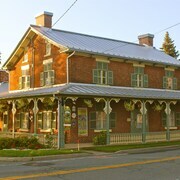 What other types of accommodations are available in St-Antoine-sur-Richelieu? Explore St-Antoine-sur-Richelieu with Expedia.ca’s Travel Guides to find the best flights, cars, holiday packages and more!